Installation view of Yinka Shonibare’s The British Library, 2014, at Tate Modern in 2019. Photo: Oliver Cowling. Tate announced today that it has acquired The British Library by Yinka Shonibare, an installation comprising 6,328 books bound in the British Nigerian artist’s trademark Dutch wax print. Printed in gold leaf on the spines of nearly half of the books are the names of first- or second-generation immigrants to Britain who have made significant contributions to British culture and history, including T. S. Eliot, Henry James, Hans Holbein, Kazuo Ishiguro, Zaha Hadid, and Anish Kapoor. Other books were left unmarked, suggesting that the story of immigration in Britain is still being written. 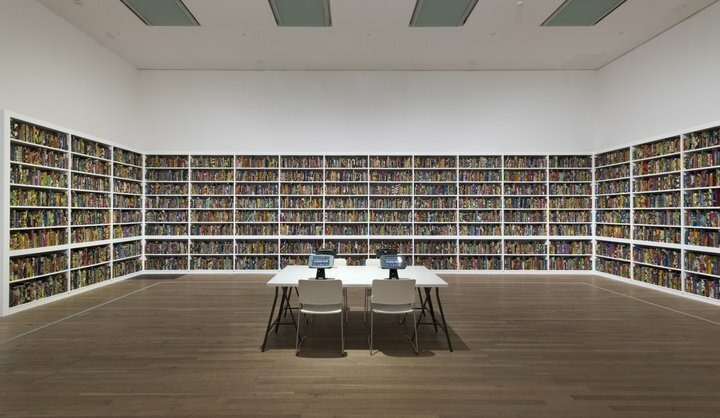 Purchased with support from the Art Fund, the Tate International Council, the Africa Acquisitions Committee, Wendy Fisher, and the Ekard Collection, the artwork was first shown in the Old Reference Library at the Brighton Museum and Art Gallery for the 2014 Brighton Festival. Since then, it has traveled to Turner Contemporary in Margate and was exhibited in the Diaspora pavilion at the Fifty-Seventh Venice Biennale in 2017. An important aspect of the work is |thebritishlibraryinstallation.com|its website|, on which visitors can scroll through the names of the authors represented in the installation. It also contains recent materials selected by the artist to present different viewpoints relating to immigration and provides visitors with the opportunity to submit their own stories. The site can be accessed through tablets in the exhibition space.